William Odis Clark, born July 21, 1915, was the son of William Alexander Clark and Annie Ethel (Mullinax) Clark. William Odis was born and raised in the Wright Community in North Parker County, Texas (what is now known as the Friendship Community). He was the 3rd of 9 children. Three of his siblings died in infancy and another died at the age of about 20 after giving birth to a baby girl. He was close to all of his siblings: Alvin, Troy, Lucille and Betty Sue. He often told stories of his childhood to his own children and grandchildren that frequently involved the antics of his two brothers, Alvin and Troy. His tales meant a lot to him and he would express a great deal of amusement while telling them. Sometimes he would get so involved in his stories that he would forget to spit or he would get to laughing so hard that his Redman chewing tobacco would dribble out of the corner of his mouth. He had a wonderful sense of humor for story telling. William Odis was more commonly known as just “Odis” in his younger years. But later in life many of the family, not just his grandkids, affectionately called him “Granddad”. Sometimes even non-family members called him Granddad. During his childhood he helped out on the family farm and when he got older, he and his brother, Alvin, ran a dairy farm in Springtown. But on March 25, 1941 he joined the United States Army where he was discharged after a few months due to severe varicose veins. He was stationed at Fort Sills, Oklahoma. After the Army he returned back to the family farm. Although not much is known, it was probably near his Army days or shortly before that he met his wife, Minnie Alice Keen. She was also a longtime resident of North Parker County. Minnie Alice, born October 1, 1920, was the daughter of Morris Nickelson Keen and Lois Mae (Barger) Keen of Springtown. Without telling anyone, on April 23, 1943, Odis and Minnie Alice snuck off and got married. Once Minnie Alice’s mother, Lois, discovered the marriage she was upset by the secrecy but she told them that if they are married then they weren’t to spend another night apart. Lois had Odis move in with them were she always treated him like her own son and did so until her death in 1992. Eventually Odis and Minnie Alice bought a home of their own just a block away from his in-laws in North Fort Worth (the term “in-law” was never used in the family, they considered Odis their son). Now I’m not sure who bought their house first but Odis’ sister, Lucille (Clark) Knox and her husband, JC Knox, also owned a home about a block away from Odis. Because of the close proximity, Lucille and Odis’ families spent a lot of time together. Lucille had one child, Danny, and Odis and Minnie Alice went on to have five children: Larry Wayne, Glenda Dianne, Judy Marlene, Gerald Ray, and William Morris “Billy”. Minnie Alice stayed home and raised the kids while Odis supported his family by working as a warehouse clerk for General Dynamics. They were the model family. Odis and Minnie Alice were actively involved with their children; camping, fishing, family vacations, etc. And every Christmas Minnie Alice would cook a feast of a breakfast, then for lunch they would go to Lois Keen’s home to be with Minnie Alice’s family, and next it was off to Weatherford to spend time with the Clark’s and Mullinax’s. They were also a very spiritual family, rarely missing a Sunday at Rosen Heights Baptist Church where they were long time members. I know it was hard on Odis when in 1969 Minnie Alice died at such a young age. But he went on doing his best to raise his children. He often had the help of neighbors and family. And even though I never met my grandmother, I felt like I knew her. Odis kept her memory alive and she was talked about frequently. I know he missed her a great deal and thought of her often because I can remember a couple of occasions where I heard him address different family members as “Minnie Alice”. Odis retired from General Dynamics in the mid to late 1970’s after 33 years. I remember him coming home after his retirement party and spreading all of his gifts across his bed: fishing poles and a picture of an F16 signed by his coworkers just to name a couple. And even though he lived in Fort Worth, Odis never forgot his roots. He made many visits to Weatherford to visit his siblings and their families. 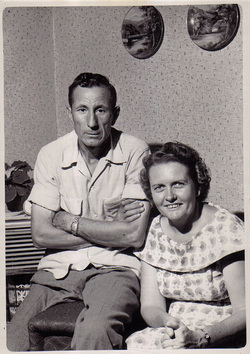 After retirement he moved in with his sister Lucille and JC Knox, who had retired earlier and moved into a mobile home located on Lucille’s piece of the Clark farm. Just before her death, Ethel Clark had divided the farm among her 5 children and one grandchild. All three loved the outdoors, often sleeping on cots out in the yard when the weather permitted. Odis eventually bought a mobile home of his own and put it on his piece of the Clark farm, directly across the road from Clark Cemetery. He enjoyed a simple life in retirement. I can recall many summers where we (my parents and siblings) would go visit Granddad and help him in his garden. He had a large garden, over an acre. Lucille and JC would usually help too, along with Danny Knox and his family. And when we were done we would then go to JC and Lucille’s garden, which was just as large, and work it. There were many times were all the grandkids (Missy, Tammy, Mark, Sam, Kerry and Curtis) would be sitting on the huge mound of potatoes, watermelons or onions piled in the back of Granddad’s pickup truck. Everyone has their own little quirks or rather habits that make them unique. And Granddad was no exception. He would usually start each morning with a cup of coffee, his spoon making a clinking sound as he swirled it around and around his cup hitting the sides. He was very active and so when he was done with his coffee he would go count his cows to make sure that none of them had wondered off. But the habit that Granddad’s family most teased him about involved his compulsive need to rid his property of weeds. It wasn’t uncommon to see him bent over in the field of his 40 acres pulling weeds with his pocketknife. Sometimes it would take him hours to go count his cows on the far side of his property because he couldn’t just walk past a weed. It’s a wonder that he didn’t walk hunched back from all his weed pulling. I think all of his grandkids would agree that one of the best memories of Granddad was sitting on his knee. It seems like he always had a kid on each leg. But we could also count on him to have frosted oatmeal cookies in the cookie jar. He didn’t cook much but 2 things I remember are his red beans, often referred to as “Granddad’s beans”, which he would spend all day preparing, and his grilled hamburgers. To this day we still refer to them as “Odie Burgers”. Granddad was a kind and gentle man. Babies always went to him with a trusting ease. I was told that he was likely so gentle because as a baby he would often sit at his blind grandfather’s feet playing (most likely Jim Clark who probably had cataracts or developed some kind of eye problems later in life as he was not known to have been blind as a young man – he is seen in a 1926 photo sitting in a chair and holding a cane). Granddad rarely raised his voice. In fact, the harshest thing he ever said to any of his grandkids was “You can stay but that rackets got to go” - -but he always said it with a smile.